In this essay, Dr. Jason M. Kelly analyzes the American Historical Association’s recent statement on embargoing completed history PhD dissertations and provides an in-depth summary of the history of the open access movement. Dr. Kelly–an Associate Professor of British History at IUPUI as well as Director of the IUPUI Arts and Humanities Institute–challenges us to consider the ways in which digital technology offers the potential to establish new, open methods for creating scholarship, methods that hold the potential to “transform our profession.” While this essay focuses on open access within the history profession, it is an issue that all disciplines will have to address in the future. To read more about open access, see “Reinventing the Academic Journal: The ‘Digital Turn’, Open Access, & Peer Review,” another piece written by Dr. Kelly in collaboration with Dr. Tim Hitchcock of the University of Hertfordshire. On 22 July 2013, the Council of the American Historical Association (AHA) released its “Statement on Policies Regarding the Embargoing of Completed History PhD Dissertations.” The purpose of the document was to argue that it was in the best interests of graduate students be allowed to “embargo” their dissertations for a period of up to six years. In the document, the AHA encouraged graduate programs and university libraries to follow their suggestions, keeping dissertations offline while the authors could convert the manuscripts into books. Within hours of the announcement, there were a flurry of blog posts and tweets, and scholars, including myself, took a range of positions — sometimes supportive, sometimes critical. The debates have tended to focus on open access and standards of promotion and tenure within universities. In the weeks that have followed, the debates have been rancorous at times, but the overall conversation has the potential to be quite productive. Among other things, it draws attention to fundamentally important issues that have the potential to transform our profession. Open access is a broad term that describes the principles, practices, and movements associated with the attempt to make information, especially digital information, freely available. For many open access advocates, the desire to share knowledge is a socio-political project. At its core is the the principal of global social equality in which everybody, regardless of background, should have equal access to knowledge. The idea of open access is not new. The term “open access” was already in use by 1787, when Richard Cumberland argued that the press provided “open access” to “all men.” By 1899, there were discussions over “open access” among librarians in the American Library Association. They debated over whether patrons should have access to books within libraries as opposed to the previous system in which librarians retrieved books on behalf of patrons — and, consequently, put barriers between readers and reading materials. The publications are extremely neat and attractive, and — what to me appears most important — very cheap, and therefore quite accessible to the great public, consisting of the working class. I also warmly sympathise with the announcement on your translations that no rights are reserved. Being well aware of all the extra sacrifices and practical difficulties that this involves for a publishing concern at the present day, I particularly desire to express my heartfelt gratitude to the translators and participators in your work who, in generous compliance with my objection to copyright of any kind, thus help to render your English version of my writings absolutely free to all who may wish to make use of it. Should I write anything more which I may consider worthy of publication, I will with great pleasure forward it to you without delay. With heartiest wishes for the further success of your efforts. The spirit of Tolstoy, Guthrie, and many other continued through the counter-culture and New Left movements of the 1950s, 1960s, and 1970s. And, early computer programmers picked up on the principles of shared knowledge, though they often stripped it of its political motivations. ■ The freedom to run the program, for any purpose (freedom 0). ■ The freedom to study how the program works, and change it so it does your computing as you wish (freedom 1). Access to the source code is a precondition for this. ■ The freedom to redistribute copies so you can help your neighbor (freedom 2). ■ The freedom to distribute copies of your modified versions to others (freedom 3). By doing this you can give the whole community a chance to benefit from your changes. Access to the source code is a precondition for this. In other words, while the GNU project stressed openness, it was not anti-capitalist. While the GNU project focused on software development, the innovations of the internet and the world wide web created the potential to exchange knowledge across the globe within fractions of seconds. With it also came the possibility of making this knowledge freely accessible to anybody with internet access. As in the software design community, arguments began to stress the revolutionary potential of open knowledge. By the late 1980s, a number of open access journals began to be published, and in 1991, arXiv.org was founded by Paul Ginsparg at Cornell. arXiv is a repository and distribution service for science articles, which set the model for numerous other open access repositories. In 2003. this was followed by the Bethseda Statement on Open Access Publishing and the the Berlin Declaration on Open Access to Knowledge in the Sciences and Humanities, which emphasized the centrality of open access to research across the disciplines. And, since then, both the movement for open access and the standards and practices of open access have grown and developed. Prevalent in this debate has been concerns over financial matters. There has been a tension between open access and market interests — and debates between liberal and socialist ideological positions — which parallel debates in the free software movement. To what extent should knowledge be beholden to the forces of market capitalism? How does an artist, programmer, or writer make a living by distributing their work in an open access format? In what ways do systems of production and exchange embody socio-political structures? How do systems of open access reproduce or disrupt social inequalities? Even as many professions and disciplines have increasingly accepted and advocated for the open access model, there have been significant disagreements about its implementation. There are professional practices, economic interests, hierarchies, and traditions, which can undermine the adoption of open access formats. This is certainly the case in the historical profession as the recent flap over dissertation embargoes made clear. Take, for example, the claim in the AHA statement that “History has been and remains a book-based discipline.” This was an argument used to justify the embargoing of dissertations. It went as follows. First, publishers are reluctant to publish books based on online dissertations (although the evidence is weak on this point). Secondly, many promotion and tenure committees require a book. Therefore, authors should have the choice to keep their dissertations offline for up to six years while the author prepares their book manuscript. The statement is meant to protect the interests of junior scholars, but there are a number of assumptions inherent to the move that reveal the complexity of the situation. The AHA claim that “history remains a book-based discipline” is embedded in traditions which are rooted deeply in academia. At research institutions, the book is the standard of scholarship. Many justify this perspective by arguing that the work it takes to prepare a book is very different from other research outputs. This is true, but the claim values academic book production over other forms of research. The reasons for their value judgement are vague and lack evidence. Certainly, not every book is created equal. And, an article such as E.P. Thompson’s “The Moral Economy of the English Crowd of the Eighteenth Century” or Natalie Zemon Davis’s “The Reasons of Misrule: Youth Groups and Charivaris in Sixteenth-Century France” far surpass the scholarly influence of most books. The reasons for privileging the book should be dependent on the needs of the scholar and the audience — not the traditional practices of the discipline. The academic system has long retained guild-like practices, and the crafting of a book is in many ways equivalent to the apprentice’s submission of a masterpiece to a guild. The object represents expertise, which in turn gives access to a closed society. And, since academic hierarchies are made and sustained through reputation, the book has become a symbolic marker of distinction. Consequently, the book has in many ways become an end to itself. Rather than creating research outputs that are best suited to content and audience, academic historians must produce a particular kind of object. The effects of this are not inconsequential. Promotion and tenure committees within academic institutions have little impetus to reconsider the markers and measures of academic quality. As such, non-traditional research outputs — including those produced in open access formats, such as blogs, data sets, and websites — are not only devalued, but most promotion and tenure committees have poor measures in place to assess them. It is this, rather than any threat to publishing prospects, that threatens the success of junior scholars who might be eager to produce scholarship in the open access environment. Likewise, the open access movement has much in common with the aims of Public History, a field in which openness and accessibility play a prominent role and in which research outputs diverge from traditional academia. Prioritizing the book over other forms of scholarship reinforces a division between those who produce work for other scholars and those who produce work for and with the public when, in fact, both academic historians and public historians should be producing work for and with other scholars and the public. But, the book is much more than simply a symbol of scholarly expertise. It is an object at the nexus of economic relations. For academics, the publication of a book is associated with significant financial benefits. For academic presses, the book is associated with significant financial risks. Publishers decide to publish in light of markets, and while academic editors can be essential to developing an author’s ideas, there is always a tension between academic quality and financial efficacy. For publishers, distributing knowledge is still a financial decision, and this means that the information contained in them is a commodity. Those who can pay have access; those who cannot pay do not have access. Wealthy institutions, typically in wealthy countries, have the advantage. Therefore, those in less affluent institutions (and those communities that rely on them), remain disadvantaged. While it is not at all clear whether the dissertation embargo will be a benefit to junior scholars, it will certainly limit the benefits to their audiences, which in the 21st century increasingly expect (and need) easy and affordable access to knowledge resources. Junior scholars themselves actually stand to benefit from the open circulation of their work. It helps them build a readership and a reputation, and it helps them demonstrate the impact of their work to promotion and tenure committees. Likewise, publishers will stand to benefit by signing book contracts with authors who have an established readership. After all, they are unlikely to benefit from the embargo, which releases dissertations at roughly the same time the book goes to press. And, given the fact that many universities have had to cut back their purchasing budgets, an audience helps guarantee that faculty members will request that their libraries purchase books. As it pertains to open access, professional organizations, such as the AHA, can do several things that have the potential to protect junior scholars, provide content to wider publics, and sustain scholarship. While many groups, including the AHA, have made statements in support of open access, a deeper intervention into the ecology of knowledge production and exchange is necessary. Creating policies to protect junior scholars from the practices of publishers and tenure committees might best be accomplished through challenging and guiding these committees to reassess and rework their standards and measures. Do these standards and measures encourage the best scholarship? Do they reproduce traditions that might stifle advances in the discipline? How do the standards and measures of tenure and promotion committees reinforce hierarchies and limit alternative models of knowledge production? Doing so will require a socio-economic critique of the links between institutions, professional organizations, and publishing. Emerging from this critique, there is the potential to align four things: the need to protect scholars, especially early career researchers; the democratizing drive of open access; the desire to improve and expand high-quality scholarship; and the expansion of traditional and non-traditional research outputs that can reach diverse publics around the world. Note: Since the publication of this essay, two sentences have been modified to clarify the AHA’s position on embargoed dissertations. The AHA has argued that students should be able to choose whether or not their dissertation is embargoed. The original statements said that AHA recommended that dissertations be embargoed. Richard Cumberland, “No. 43,” The Observer: being a collection of moral, literary, and familiar essays, vol. 2 (London: 1786), 138. “American Library Association, Atlanta, GA, May 8-12, 1899,” Public Libraries (January 1899): 288. Leo Tolstoy, Patriotism and Government (London: The Free Age Press, 1900). Dan Cohen and Roy Rosenzweig, Digital history: a guide to gathering, preserving, and presenting the past on the Web (Philadelphia: University of Pennsylvania Press, 2006), 206. Richard Stallman, “Why Open Source misses the point of Free Software,” GNU, http://www.gnu.org/philosophy/open-source-misses-the-point.html, accessed 7 August 2013. “The Free Software Definition,” GNU, http://www.gnu.org/philosophy/free-sw.html, accessed 7 August 2013. “The GNU Manifesto (1993 edition),” GNU, http://www.gnu.org/gnu/manifesto.html, accessed 7 August 2013. Budapest Open Access Initiative, February 2002, http://www.budapestopenaccessinitiative.org/read, accessed 7 August 2013. Peter Suber, one of the architects of the Bethseda Statement, has summarized many of the core principles here. This entry was posted in Uncategorized on August 12, 2013 by Nick Sacco. Janice Franklin is a graduate student in European history at IUPUI. She is currently working on her master’s thesis, which will analyze the artwork of German Expressionist Painter Gabriele Münter. In this essay, Janice argues that digital documentation of historic artwork may pique the interest of those who want to learn more about art history. Yet she also suggests that looking at artwork on a computer screen cannot recreate the “impact” of seeing artwork in person. For this reason, preservation of material artifacts is still vitally important in our efforts to study and understand the past. A lone woman sits motionless in her seat, gazing at her admirer as though surprised by this unannounced visit. Her mouth unfurls into a sheepish grin; she does not admonish her viewer for sneaking into her dwelling place. However, she does nothing to welcome her guest into her space, a domestic environment teeming with the trappings of household comforts: luxurious curtains, a cozy chair and a bouquet of beautiful tulips, swirling elegantly from their vase. A gleaming sunset casts looming shadows against the façades of the buildings just beyond her window. The golden glow on the right side of her face suggests that a second window resides beside her, just out of sight. As she continues to stare, her viewer moves on. However, she will endlessly remain immobile. To see her once more, all we must do is turn on our computers and seek her again. 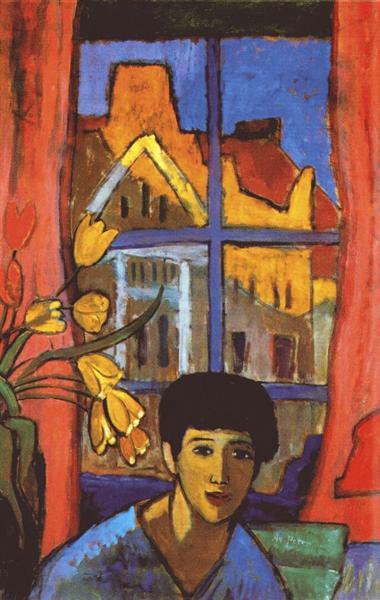 This woman is the solitary figure in Gabriele Münter’s iconic painting Woman in Stockholm (The Future), completed in 1917. Nearly one hundred years since its creation by the artist, the painting is still beautifully preserved, and also available for viewing on a number of Internet search engines. In modern society, it seems mundanely commonplace to “just Google it”, but we must stop and analyze the vital importance of this method of artistic preservation. Not only does this form of digital documentation preserve an image of the masterwork, but it may also access a broader audience of all ages. Digital documentation may even inspire interest in the field of art history by accessing media-savvy, museum-wary viewers, curious to see the works they love onscreen first-hand. Digital preservation also serves a unique purpose in worst-case-scenarios, such as the alarming October 2012 art theft from the Kunsthal museum in Rotterdam. Recently, the crook’s mother, Olga Dogaru, claimed that she incinerated the stolen pieces to destroy evidence of her son’s thoughtless thievery. Among those stolen were pieces by Pablo Picasso, Henri Matisse, Claude Monet, Paul Gauguin, Lucian Freud, and Meyer de Haan. According to The New York Times, the head of Romania’s National History Museum, Ernest Oberlander-Tarnoveanu, called the supposed burning a “barbarian crime against humanity.” While Dogaru has since come forth and denied her original claim of burning the masterworks, the art world may be forced to brace itself for the worst: the priceless pieces loved by so many may be lost permanently. However, digital documentation of these images provides a way to continue to access these remarkable works long after they disappear. While nothing can ever replace the genuine artwork, a digital replica may be a suitable and enduring substitute that may be enjoyed for years to come. The study of art history is changing rapidly with the increasing desire to digitally document works of art for historical preservation purposes. Recent innovations in modern technology have aided in the photographic documentation of visual imagery, both two- and three-dimensional. The Google Cultural Institute has created the Art Project, a website that features more than 40,000 images of world-renowned works of art, available to everyone from the casual art viewer to the passionate scholar, all in supremely high definition. So precise are these images that one may zoom in so closely on Vincent van Gogh’s legendary Starry Night (1889) that traces of canvas can be seen through the impasto paint strokes. To be so close to the genuine image would likely earn the viewer a hearty reprimand from the museum. With digital documentation, however, it is possible to explore these magnificent works of art at one’s leisure and in superb detail. I believe this form of digital documentation allows a broader audience to enjoy subtleties of iconic images in an uncommonly intimate way. Münter, Gabriele. The Future (Woman in Stockholm). (Current location: The Cleveland Museum of Art). 1917. Higgins, Andrew. “Romanian Denies Burning Stolen Art.”New York Times. (2013): n. page. Web. 2 Aug. 2013. This entry was posted in Uncategorized on August 8, 2013 by Nick Sacco. During the development of this Digital Sandbox workshop, numerous lively discussions ensued amongst the executive committee members about the outcomes and vision of this project. Chief among them pertained to scope: as a committee composed of public history students, how do we compose a workshop which encapsulate the broader humanities? Nick Sacco, a second-year Public History graduate student at IUPUI and member of the executive committee, weighs in on what he feels is the nature of Public History and where it fits into the larger humanities puzzle. During my studies in the public history graduate program at IUPUI, I have been challenged to think about the study of history within a larger context of the entire humanities discipline. For example, I’ve learned about various ways in which historians have utilized methods in anthropology, art history, and library science (just to name a few) in their quest to understand the past. I am very glad to have had this well-rounded education thus far, but I still find myself frustrated by several artificial divisions and a lack of communication between disciplines. For this essay, I would like to consider the possibilities of digital technology in shaping the way liberal arts and humanities students engage with their scholarly projects. With regards to my own training in public history, I have been introduced to many exciting works now being done in the digital humanities. However, many history students across the country have been greatly impoverished by their lack of training in the use of digital technology to enhance their interpretive skills and create new works of scholarship that sharpen society’s perceptions of the past. In my opinion, the digital humanities could redefine how all liberal arts and humanities students construct scholarly knowledge. In a survey of public history programs last year, Shippensburg State University professor Steven Burg discovered that while 64.5% of program directors positively responded that their students would be graduating with “competency in digital history and new media,” only 35.9% stated that they were actively preparing their students to create or author works of digital scholarship. It would be interesting to see what the numbers are for other humanities disciplines. My guess would be that there is room for improvement. Some historians/degree programs have embraced the digital landscape as a means to ask new questions of the past, engage with new audiences, and build new works of historical scholarship that go beyond writing or typing a term paper. Many of these projects incorporate the work of many other disciplines, not just history. For example, UCLA’s Miriam Posner recently taught a class where students built a database and web-based interface for housing “ancient magical implements” and other historic artifacts. This class represented an exciting collaborative endeavor between historians, anthropologists, and archaeologists. William G. Thomas and Patrick D. Jones have created a community-based project called “The History Harvest” at the University of Nebraska-Lincoln. Jeremy Boggs, Trevor Owens, and Dan Kerr have taught various classes at American University that have incorporated critical analysis of digital tools and resources with the building of interactive works of digital scholarship. Here at IUPUI, Jason M. Kelly recently taught a digital history class where we created digital walking tours of Indianapolis that attempted to ask critical questions about the city’s history and its built environment. (My group’s project is here). I am hopeful that some of the artificial boundaries between the humanities, sciences, and technology can eventually be blurred, and a recent article from Nigel Thrift has persuasively argued that yes, the nature of disciplines in academia does seem to be changing. Despite these exciting ventures, I feel that our Digital Sandbox workshop is important because there are not enough of us in the humanities as a whole who are discussing the promises and perils of digital technology as it relates to work in the humanities. Furthermore, we can’t even begin to have these discussions because many of us don’t even know what’s out there for us to utilize. This workshop will hopefully provide some much needed digital awareness for humanities students at IUPUI. History has much to add to the digital humanities, while the digital humanities has much to offer those who study the past. Some historians have successfully engaged in collaborative projects–exhibits, living history performances, and other educational programs, for example–that have reached a diverse nonacademic audience. Reaching that audience is crucial because “history is done by lots of people who don’t have academic degrees or tenured professorships,” as Mary Rizzo explains. Likewise, there are many passionate people beyond the walls of academia who enjoy studying literature, religion, art, philosophy, the performing arts, and many other fields within the humanities. Conveying scholarly knowledge through a book can be useful, but digital technology challenges those in the humanities to consider new models and mediums for sharing their scholarship, especially since the value of the humanities has recently been questioned by an American society still reeling from the 2008 recession. I believe that building collaborative works of scholarship may help to extend our work to a broader audience. Before we begin building, however, we need to first educate ourselves about the tools and theories that mark the digital landscape. For instance, I have seen splits between “academic” and “public” historians, and between historians and museum studies students, but I am sure there are more that exist. For a good essay that questions whether or not digital technology democratizes access to information in the humanities, see Amy E. Earhart, “Can Information Be Unfettered? Race and the New Digital Humanities Canon” in Matthew K. Gold, Debates in the Digital Humanities (Minneapolis: University of Minneapolis Press, 2012), 309-319. This entry was posted in Uncategorized on July 27, 2013 by Nick Sacco. Digital technology is playing a more integral role in humanities research of all types. Noah Goodling explores how these tools are altering the way historians conduct their own research and analysis into the past. Noah is a third-year graduate student in the Public History program at IUPUI. The introduction of digital technology into historical study has already begun to have interesting and far-reaching effects on the field. Historians have reacted in various ways to the new tools at their disposal—some have maintained “a print mentality when it comes to information,” while others have embraced the new arena of digital technologies that emphasizes practices like hypertextuality and collaboration. Moving forward, it seems that it will be increasingly important for historians to be familiar with, and to utilize, digital technology in their projects and research. I believe that the field of history today is undergoing a paradigmatic change towards embracing the power and versatility of digital tools to find new interpretations and to disseminate that information to as broad an audience as possible. Digital technology has already begun to pervade the field of history. Many datasets that were extremely difficult to study in their original format have found new expression in the digital realm. For example, the massive Bayeux Tapestry depicting English history was a nightmare for researchers to study due to the fragility of the source material and the difficulty of closely analyzing scenes in the tapestry that were not directly adjacent to each other. Digital tools have greatly assisted the study of this artifact by providing a place in which the entire tapestry is readily available to view, accompanied by multiple scholarly interpretations, links to sources of other relevant data, an indexing of the events depicted in the Tapestry, and other useful materials. Other digital projects have utilized historical information in new areas, such as the use of the papers of Abraham Lincoln to study word origins and the terminology of the nineteenth century. In both of these cases, historians were unsure of what would happen when digital technology was introduced into the equation, but have been able to find extraordinary results through its application. Tim Hitchcock, a professor at the University of Hertfordshire, has noted that oftentimes when using digital technology, we “have no idea what [the end result] means,” but the data “suggest[s] different ways of thinking.” This is the crux of what makes digital technology so exciting—it provides a flexibility in historical research to answer questions about data that would be practically impossible without it, but it also provides a place to discover questions that no one has thought to ask. The ability to play with data by using digital technology demonstrates how historical practice is changing with the advent of these new tools. Questions that would have previously taken months of research to answer can now be found in the course of seconds through the use of powerful search algorithms that mine aggregated datasets for selected information. For example, the Old Bailey Online project provides access to a massive amount of English trial data from the 17th to the 20th century. This information can include date ranges, gender, type of offense, profession, age, name, verdict, and punishment received. Having this metadata at the user’s fingertips can lead to new questions being asked about the past: how many goldsmiths in the 18th century were found guilty of creating forged products? What proportion of women were put to death in the 19th century compared with men? Although the immediate search results are not necessarily historical breakthroughs, the accessibility of the data in the hands of experts has led to new analyses about social and material culture in England during the available period. Even simple visualizations of data and metadata have led to new insights into what historical information is available through a selected source. The Republic of Letters project conducted at Stanford University simply maps out the exchange of letters between Enlightenment thinkers. This tool allows a trained historian to trace the exchange of information and ideas through Europe and America throughout the course of the Enlightenment. Just by observing the flow of letters, historians have already begun to question assumptions that have been made about which authors originated which ideas. After looking at some of the exciting applications that digital technology has already had within the field, I think it is obvious that these tools have a future within the field. Perhaps the most important realization, then, is to note that historians will not be able to proceed alone. Although many historians have already begun to garner new technological proficiencies, the rate of technological increase and the logistical complexity of digital projects–for example, creating code for a text mining software program–necessitate opening the field to outside perspectives and skillsets. Rather than being viewed as a tragic necessity, however, I believe that the historical field serves to benefit from collaboration. As historian William G. Thomas III has stated, “digital history is an open arena of scholarly production and communication,…[it] encourages readers to investigate and form interpretive associations of their own.” Opening the gates of history not only encourages new interpretations, but it also assists viewers in finding personal connections with the information being presented. Beyond engaging other disciplines, digital technology also embraces the idea of shared authority, allowing the public to interact with professionals online means such as discussion forums and crowdsourcing historical research projects. Bringing the public to a closer understanding and appreciation of their history should be a goal of all historians; digital technology provides new tools to make that ideal more feasible. John Theibault, “Visualizations and Historical Arguments” in Writing History in the Digital Age, ed. Jack Dougherty and Kristen Nawrotzki (Spring 2012). Martin Foys, “The Bayeux Tapestry Digital Edition: Online and CD-ROM,” http://www.sd-editions.com/bayeux/. Tim Hitchcock, “Textmining British Studies: an Overview of Recent Developments,” History Working Papers (2012). “The Proceedings of the Old Bailey, 1674-1913,” http://www.oldbaileyonline.org/. “Mapping the Republic of Letters.” https://republicofletters.stanford.edu/. For further information, this video shows project leader Don Edelstein discussing the results of the project: http://www.youtube.com/watch?v=nw0oS-AOIPE. “Interchange: The Promise of Digital History.” The Journal of American History 95, no. 2 (September 1, 2008),http://www.journalofamericanhistory.org/issues/952/interchange/index.html. This entry was posted in Uncategorized on July 20, 2013 by Nick Sacco. In the weeks leading up to the Digital Sandbox Workshop, this blog will feature ruminations from the IUPUI community on Digital Humanities. This first entry, appropriately enough, is from Nancy Brown. Nancy graduated with her MA in history from IUPUI in May 2013, and will begin her doctorate in history this Fall at Purdue University. In essence, the genesis of this workshop was Nancy’s idea, after she plunged into the world of Digital Humanities in the Fall of 2012 while serving on a search committee for a Digital Historian position. We are excited to have Nancy contributing to both this blog and as a panelist. When I heard that the organizing committee had named the upcoming fall workshop, “Digital Sandbox,” I smiled. I often use the expression, ‘play computer’ when I am working on a computer project. “Digital Sandbox” reminded me of the fun my children had while spending hours outside in their sandbox digging holes and building castles. After a quick Google search, I was surprised to find that “Digital Sandbox” is associated with with “safety” and “risk management.” Perhaps it’s my age showing, but since when did a sandbox become synonymous with safety? If you observe toddlers play in the sand, inevitably one of them will taste the sand and quickly discover how difficult it is to get out of a mouth. Someone else will experiment with throwing sand resulting in a painful lesson on sand in the eyes. Meanwhile, the ever present danger of bees, sunburn and evidence of a visit by the neighbor’s cat lurk in the background. As kids grow older, sandbox time includes arguments over who gets the special dump truck and complaints over smashed creations, as well as the risk of the not-so-friendly-swing of an angry shovel. Still, when the kids went out to play, the sandbox was a favorite destination. It’s hard to play in a sandbox without getting dirty and having a few upsets. The same holds true for playing on a computer. We make mistakes. It’s certainly painful the first time your computer crashes in the middle of a writing project that you hadn’t backed up or after you spend days developing a spreadsheet and entering data and then find you forget an important field. One might wonder if the value of technology outweighs the potential for catastrophe. Perhaps we view our acquisition of technology skills as means to an end. Educators have dissected the sandbox experience to justify its inclusion in the preschool and elementary classroom. According to experts, sandboxes improve fine motor skills, foster a sense of cooperation and demonstrate cause and effect. Similarly, we might learn programing to strengthen our logic skills and participate in blogs to improve our analytical writing ability. Of course, as a parent I care about educational value, but truthfully, we built a sandbox for the kids because sandboxes are fun. I experience the fun in a digital environment as the process of creation and discovery—even if that discovery is something as simple as figuring out how to bold a column in Excel. I urge you to find what you enjoy about learning and research. Bring those intrinsic motivations to the Digital Sandbox. This entry was posted in Uncategorized on July 11, 2013 by Callie.